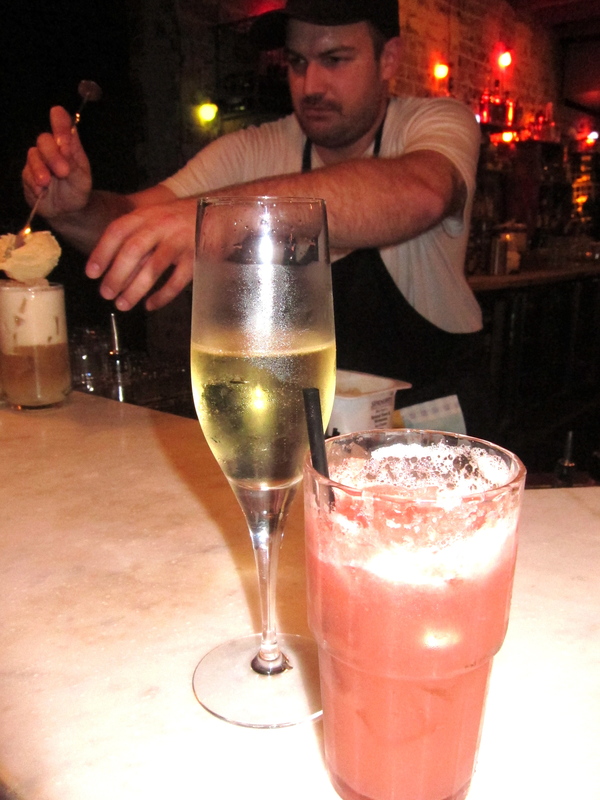 Located upstairs from the Marlborough Hotel, "Miss Peaches" is the latest newcomer on the Newtown bar / food scene. Loud, brassy, vivacious and a bit down and dirty, this American gal is more honky-tonk than Southern Belle. You enter the premises from a side-door on Missenden Road lit with an unobtrusive neon sign. Leg it up the basement style staircase past the graffiti image of the establishment's name and there you are. The casual, almost industrial interior seems a bit like the inside of your grandpa's garage - exposed brick and beams, bare bulbs, daggy old lounges in a dim corner. Patchwork prints adorn the brick walls - perhaps Grandma's input - together with graffiti images. Loud fifties and sixties blues and soul music pumps a lively vibe through the place. You can hang at the bar on a stool, join one of the wood tables or sojourn with your drink to the verandah. Speaking of drinks, I was able to score a watermelon cocktail, which swished pleasantly enough down my mouth with its fruity freshness. Then all further opportunity for drinking dried up as the crowds swept in for the establishment's opening night. The Watermelon cocktail and the Rum and Raisin Float in the making. Drinks of the house include the Mint Juleb, the aforementioned watermelon cocktail, the Rum and Raisin Float, and American beers. Interviewing other patrons of the night for their experience, I found some weren't too hot on the Mint Juleb, complaining it was pure alcohol and too much ice. The Nevada beer was said to be full tasting. By the time I requested the popular Rum and Raisin Float, the bar was out of ingredients, so no comment from me. It did look nice. The homestyle food here takes its inspiration from the American South with turkey drumsticks, fried chicken, grits and gravy, gumbo, slice o' Sweet Pie, cornbread, hushpuppies, tater tots (deep-fried potato balls), oysters, fried catfish with hot sauce, stuffed bell peppers, blackened fish, crawfish pies, biscuits n' gravy and more on offer. Unfortunately, with the massive crowd present at this vastly understaffed opening night, all I managed to score was a single tater ball and a small cup of gumbo (a soup). Insert 'stomach groan'. Nevertheless, though not satiated, both gut and palate were well teased. The tater balls - I got one! As far as bar snacks go this is a tasty and novel divergence from the run of the mill nuts, toasted sandwiches, chips and wedges. However, novelty aside, by 9pm I had to flee, famished, to the Vietnamese restaurant across the road in search of a decent feed. Service is okay, but nothing special, however, once again, I will concede this was an opening night. 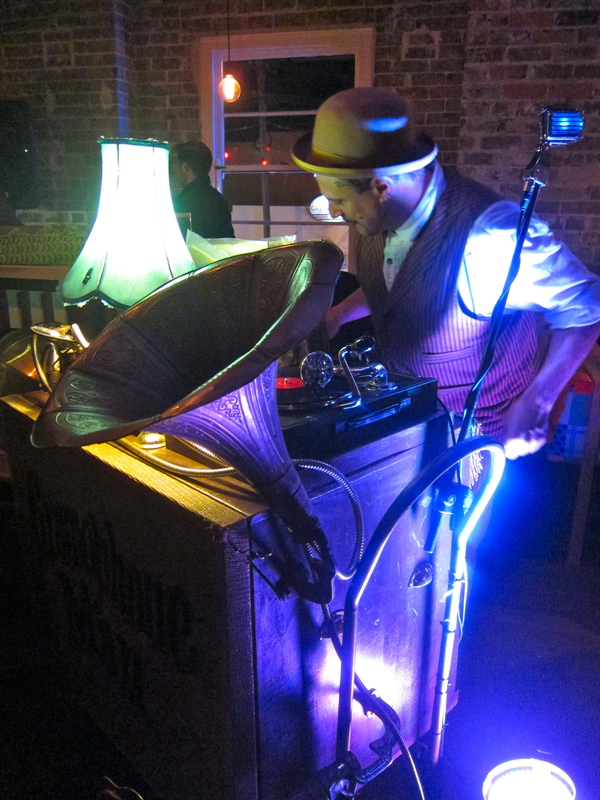 Most interesting feature of the night was DJ extraordinaire Gramophone Man, strutting his stuff to the lively rhythm and blues. Come to Miss Peaches and make your own evaluation. The venue offers a slice of Americana, interesting bar food alternatives, great music and a lively vibe. This isn't, however, for those seeking an intimate chat or mellow down-time. For an opening night this was far from impressive, with inadequate staffing levels and insufficient food and alcohol to go round. With time one would imagine this venue will find its feet. It will be interesting to see how Miss Peaches fares in Newtown. While this Southern gal promotes herself as big on soul, Miss Peaches seems more interested in her own image. Miss Peaches official address is Level 1, 201 Missenden Road, Newtown. To contact them or make a booking, click on this link to the Miss Peaches website. Miss Peaches is open Wednesday to Sunday, 5-12pm. Yo mama!